Uncle Sam's credit card is maxed out. On May 16th, the US officially hit its $14.3 trillion national debt limit, set by Congress. Things have reached a crisis. The feds are currently borrowing 40 cents of every dollar they spend. Washington has doubled the national debt in just the past 5 years. To avert national bankruptcy, this incredible spending binge has got to stop. Now comes President Obama, claiming that failure to raise the national borrowing limit by August 2nd will result in the US Government defaulting on its debts, and thus causing global bond markets to lose faith in the U.S. Government's ability to repay its creditors, and thus setting off a panic that results in higher borrowing costs for Uncle Sam, and thus precipitating a Greece-style economic crisis and perhaps political turmoil. The truth is, the IRS collects 10 times the amount needed to pay all the interest we owe to all our creditors indefinitely, and more than enough to pay the principal as well. It's true, to be sure, that we don't collect enough to pay our creditors and all of the myriad other obligations our government currently has. If we don't raise the debt limit at all, we will have to start cutting government spending and living within our means. That may create political challenges for politicians, but it's not a default. What actually happens if we don't raise the debt limit at all? Eventually, the Treasury Secretary runs out of sufficient funds and must decide which bills to postpone paying. He is legally free to prioritize among obligations until Congress tells him otherwise. Any Treasury Secretary worth his salt will always pay our creditors first, in order to avert a panic and keep our borrowing costs as low as possible. The Secretary could borrow from government trust funds, with a promise to pay them back later, and he would likely do so, to some extent. But that "fix" would only by him limited time, if, as seems likely, he opts not to touch the two biggest and most politically sacrosanct trust funds, Social Security and Medicare. At some point, he will run out of options and be forced to postpone U.S. government payments to individuals (e.g., Social Security checks) and reimbursements to contractors (e.g., reimbursements to Medicare doctors and hospitals, defense contractors, etc.). This will doubtless precipitate a political crisis, forcing Congress to make some tough fiscal choices. But it will not be a "default." The President is demanding a "clean" debt ceiling increase. That is, he wants to increase the national credit limit without any spending reductions or reforms (except tax hikes). 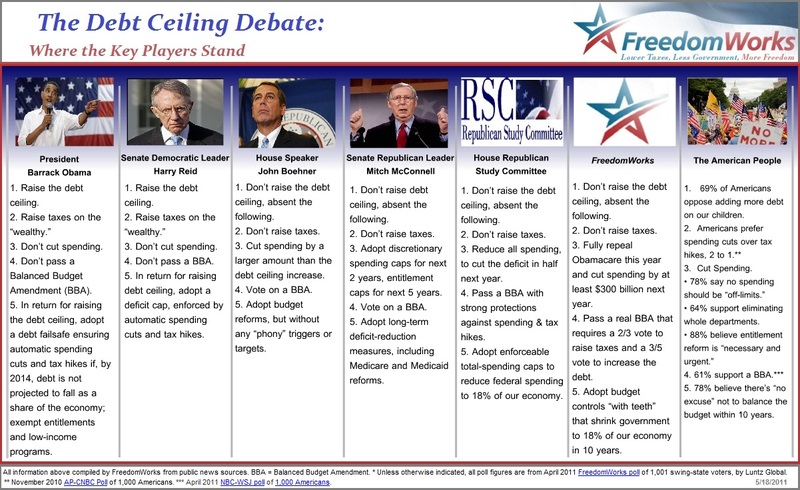 √ First, any measure to raise the debt ceiling must include real spending cuts. A good start would cut spending by at least $300 billion next year and include a full repeal of ObamaCare. Longer term, Congress must cut and eliminate programs to shrink government by at least 25% within five years, or no more than 18% of GDP. √ Second, spending reductions should be guaranteed by budget controls with teeth in the form of a law that would implement automatic, across-the-board cuts if Congress fails to enact a responsible budget. Automatic cuts must cover all programs, including Social Security. √ Finally, Congress must send to the states for ratification a real Balanced Budget Amendment that caps federal spending and makes it much harder to increase taxes or debt. Six in 10 likely voters believe a Balanced Budget Amendment is long overdue. Because Congress has proven incapable of getting spending and borrowing under control on its own, it’s time for the Constitution to force them to live within our means by making it much harder to raise taxes or pile more debt on our children. Without these kinds of serious cuts and reforms -- no deal. This debate is important for our country's future. Please take a moment to weigh in. We all need to put serious pressure on the President and congressional leaders to do the right thing. P.S. Get some popcorn and settle in. Keep your scorecard handy. This debate will keep us all on the edge of our seats. Dean Clancy is FreedomWorks's Legislative Counsel and Vice President, Health Care Policy. Graphic by FreedomWorks intern Patrick Hedger.